Doha(ANN)-Labor experts have expressed hope that a controversial visa system requiring workers to obtain permission of employers before leaving the state of Qatar could be abolished within a fortnight. The possibility was highlighted Sunday after Qatar opened an office for the International Labor Organization (ILO) in Doha. Sharan Burrow, general secretary of the International Trade Union Confederation, said the inauguration of ILO office marked a real change in Qatar’s approach to the international concerns regarding the situation of workers in the small Persian Gulf country. “We are looking now about the final details of the exit visa, we expect a deal within the next two weeks,” said Burrow, who was once known as vocal critic of Qatar’s labor laws. Other sources confirmed that negotiations were underway on exit visa, saying Qatar and the ILO would soon announce a deal on the issue. Rights campaigners have for long criticized Qatar for the controversial exit visa system which they say was a clear sign of the exploitation of around two million migrant workers in the country. The criticism increased after Qatar won the right to host the 2022 World Cup, prompting authorities to promise genuine reforms in the labor laws. 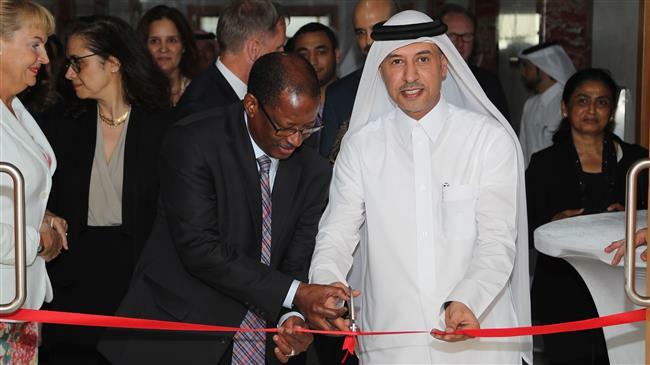 Qatar’s labor minister Issa Saad al-Jafali al-Nuaimi personally inaugurated the ILO office in Doha and said the development showed Qatar was willing to respond to concerns about its treatment of the foreign workforce. “The Government of Qatar now has another partner to promote and protect the rights of our guest workers,” said Nuaimi, adding the inauguration was “another step towards ensuring Qatar has a labor system that reflects global best practice”. Qatar and ILO, a United Nations agency, reached an agreement last October to launch a three-year program of technical cooperation on labor issues. Under the deal, Doha would allow the ILO to oversee wholesale labor reforms, including a minimum wage and a grievance procedure for workers.